What are people saying about ModioLegal? "To me, this is a no-brainer. I am precisely the type of user ModioLegal targets. I constantly use my smartphone to consume audio information when I am on the go... I would love to be able to add legal news and magazine articles to that mix." 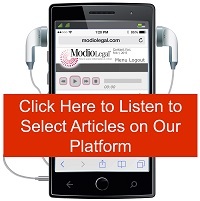 "The Modio Legal platform offers legal publishers an opportunity to take their daily newsletter content and enhance the user experience while extending the value and reach of their intellectual assets. Why not leverage the wild popularity and ubiquitous presence of the smartphones? This audiophile is ready and waiting!"